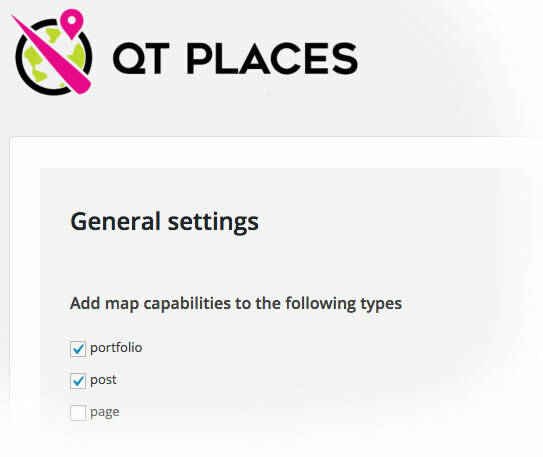 QT Places is an elegant and versatile plugin to display custom maps. BUT ATTENTION! There is only one thing you can’t do: you can never mix in the same map entries from different post types. This means that if you do a map of Places you can’t have, in the same map, also your posts. You can add map capabilities to any existing post type, standard like posts or pages, or “custom” like portfolio. In the following example you can see a map displaying the custom post type Portfolio. Very useful for example for a building company, a shop franchise, a worldwide recipes map, a tour guide, a tourism blog, a travel agency and more!